Uses the LNS5000 or LNS5082 Universal Compression Connector tool. One connector for 6 Series SCTE specification drop cables including 60% braid, Tri-shield and Quad shield. After WWII, 75 Ohm cable has been used as the Transmission Line of Choice for TV, Cable TV and Broadband Signals, Distribution Systems large and small, simply because of its plentiful abundance. As the Industry progressed, It seems there were 10 times as many Connectors as there was Coaxial Cable types, each requiring a Proprietary style of Tool to Fashion the connection with. 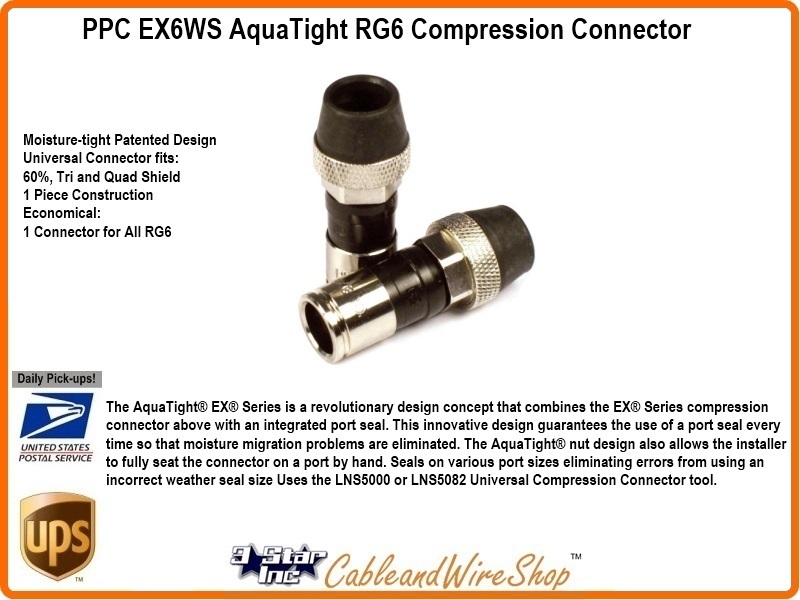 Most Folks We know stick to using the Connector style that they were introduced to, and the Manufacturer, Make and Model that they have invested in via the Compression or Crimp Tool they own. Whereas before, when each manufactured cable type introduced was paired up with a specific Model Connector from one or several different Manufacturers, many have now settled on providing Connectors whose Braid, Shield and Jacket coverage range is broader in scope, encompassing the designed ability to fit many variations of a particular sized cable. Becoming Universal certainly has its advantages... And RG6 is now the minimum size recommended for any HDTV Satellite, Off-Air DTV or Satellite TV Install. So please consider a transitional investment towards the Universal RG6 Compression Connectors and Universal Compression Tools we offer, as the sourcing of those out-dated Connectors becomes more difficult!